Now that the F80 M3 sedan has been given the greenlight, our spies have spotted the F80 M3 continuing its public road testing. While the camouflage on the F80 prototype remains the same as before, we've got some more angles to share with you - a slightly higher-down look than before. The F80 M3 continues to show off its attractive proportions and shape, while looking more aggressive and 'beefier' than the standard F30 3 series due to its widened wheel arches, M styled front and rear bumpers and sideskirts, and quad exhaust. It does not yet show the sportier mirrors that the production version F80 will receive. If you take a close look, we may be looking at a different front end on the F80 M3 than on the regular F30 3-series sedan. The clearest clue is the shape of the kidney grilles - which appear to be shapelier/curvier than those seen on the F30 3-series prototypes (see below for comparison). 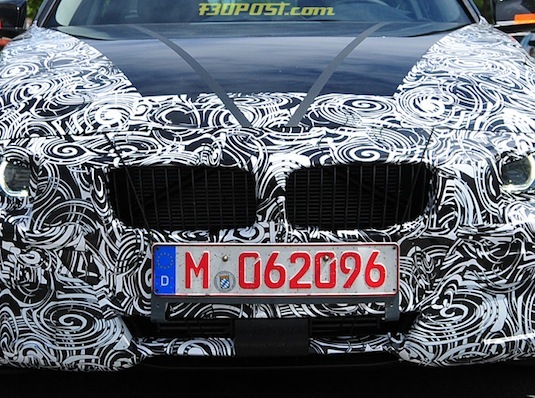 The entire front end also seems to be a different shape compared to the F30 3-series prototypes. 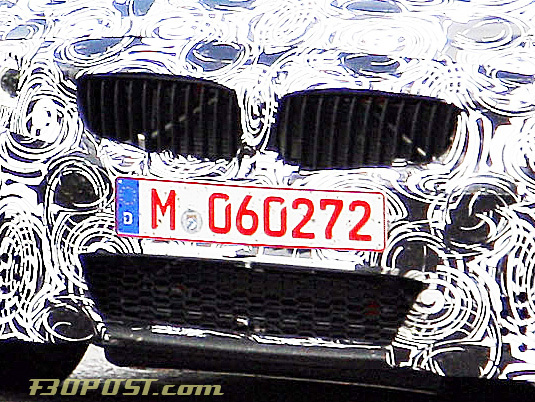 Is it possible that this prototype is wearing the F32 3 series / F82 M4 coupe's front end? Perhaps. Rumored powerplant configurations have been all over the map - from turbo V6, to modified I6 N54, to modified S63 (engine from X6M/X5M). With the recently discovered V6 turbo engine patents from BMW however, don't be surprised if the next M3 arrives with a motor which truly represents BMW M's favorite recent slogan of sticking to no dogmas - see turbo V8 in the new M5. According to a reliable source, the BMW F80 M3 Sedan will likely have its market launch in summer 2013, uncharacteristically before the F82 M4 coupe. As we reported earlier, the E90 M3 sedan will end production this October while the E92/3 M3 coupe and convertible will be produced through June 2012 at least. Here's a previous set of F80 M3 sedan spy photos, which show off some other details nicely, such as the drilled rotors and 4 piston brake calipers. Not bad. Can't really tell yet but it's looks like it's coming along well. Those exhausts look big as well. Just what I like to see. Nice shots! Can't wait to see the final product. I will also say the driver was not to happy to have the pictures taken, but come on man show a little class. I'm glad the sedan is coming back. Those wheels look like BBS FI. yeah, this front end is going to look awesome and aggressive. please tell me it is inline-6, please tell me it is inline-6, please tell me it is inline-6, please tell me it is inline-6... 60 degree V6 is great, but I6 is amazing! so please BMW!! 2013 is so far away . And the end of the E90 is just about here, so sad. Last edited by phrozen06; 09-28-2011 at 12:13 PM. LOL i didnt see that till you mentioned it. We don't know all the details between this driver and the photographer, but a test driver should understand they're representing a brand when they're doing their job. And spy shots further fuel the public's passion for the brand... especially by enthusiasts. So in the end, they're beneficial for his employer and therefore him (corp espionage and all). Very classless indeed. Back on topic, the f80 has the promise of being one of the best looking m3 at this stage. I don't remember thinking the e90 looked this good with camo. I hope it comes out in 2013 as my C63 will have right around 50,000 miles in fall 2013 perfect time for trade in! being so far away I don't think these shots give us any idea of what the final product will look like, they will probably change so much before then, we are basically looking at a new 3 series with new exhaust and engine, maybe old M3 suspension and other parts in there as well. I doubt that it will be an inline 6. If the new M5 is any indication, the new M3 will be a beast. Funny, that's the first thing I noticed, the guy flipping the bird. Wonder what BMW will think of that when they see these pics. well, if it is gonna be V8, then that will be the best, but most likely they are going to put a 6-cylinder. And some people say that the new M3 might be tri-turbo V6... I hope if BMW is going to put a 6 inside this guy, make an I6, not V6. Is it just me or do the overall shape and dimensions of this car look very similar to the current e90? Granted, the front and the rear will look different, but in some of those shots I could make myself believe it is an e90 in camo. I thought the exact same thing. Can you say, "FIRED"
You wouldn't be the first to think that they have some similar lines. I would say that from the B-pillar back is the most similar. B-pillar forward is where the F30 departs most from the E90.